Great post! Sounds like you were a pretty cool 14 year old. I enjoy watching the NSB on TV every year. I think the first time I remember seeing it on TV was in '93 (or '92?) on CNN. 1. Which TV shows were you on after you won? Any other cool things you did? 2. Did you meet Pres. Bush (Sr.) in person? Any other famous people? 3. Was the '89 national bee televised? If not, when did CNN start televising it live (I know I saw it in '93, and maybe the end in '92)? 4. Did any kids try to study the whole Webster's Third back then? 5. What percentage of the "dictionary round" words did you know in '89? 6. Would you say the words are harder now than when you were in the NSB? I read somewhere that around 80% of all the words in the NSB now, even the "dictionary" words, come from the Consolidated Word List on the NSB site, so maybe the kids have more of an edge now than they did in '89. Maybe that makes today's NSB easier? I've been thinking about making a list of "greatest moments in my life," and there's no question that the 6/1/89 twin tandem of the "Holy mackanoli, he's actually going to pull this off!" moment and the night at Trader Vic's is on that list. I keenly remember: meeting you for the first time after Gunston Hall, making our way back to the hotel, and for whatever ridiculous reason, we decided to sit down and go through words for about an hour - whereupon I realized that I was totally outclassed. This doubled as the moment that I realized, "Yeah, I'm probably going to place pretty well, but I'm not going to win," and, "Yeah. This guy, Scott, is a CONTENDER." I remember being irritated with my parents that we opted for the Baltimore Inner Harbor tour over the monuments tour on Tuesday. Of course, there was Dan Quayle. For the above poster's benefit - I represented Fort Wayne, and on a whim my parents contacted Dan Quayle's office to try and arrange a meeting. 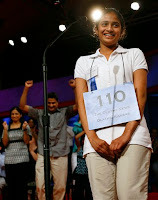 To our absolute shock, he agreed - and extended the invitation to the winner and all of the spellers from Indiana. It largely turned into a pie-throwing contest by the media centered around Quayle's misspelling of 'potatoe' the previous year, but we always appreciated the Vice-President making time to do this. I remember sitting at the banquet, and rating the cutest girls at the Bee with the others at my table. Ah, the eighth grade. I very keenly remember Marianne Hess and Betty Saxton, the two newspaper representatives from the Journal-Gazette, whom to this day I count as two of the most special influences in my life. For the past fifteen years, since the change was instituted, I've identified myself as "tied for 18th in 1988; tied for 34th in 1989." I would point out that you would have made it to the top two irrespective of your 218 draw. It's bordering on a criminal sin that I haven't converted some of our grainy videotape to digital. Effective immediately, this will become a top priority for my summer. WHEW! Lots to respond to here. David: I was on gobs of local newscasts. I was on Good Morning America the morning after (took a quick flight to NYC and got caught in a traffic jam over the Hudson at midnight), then Inside Edition and finally the Tonight Show. Johnny was still there, but I got lucky and Jay Leno was the guest host that night, and man, was he a blast! Along the way, I rubbed elbows with Kenny G and 10,000 Maniacs. Met then-Governor Roy Romer as well. Like Joel said, we met Quayle. Bush was at some summit, if I remember correctly. Only the last part of the bee (between me and Ojas) was televised live on CNN. But the bee had been televised at least since 1986. Did any kids try to study Webster's Third back then? Absolutely! That was me. I was one of those freaks who read the dictionary for fun. Yes, I think the words now are significantly harder than they were back then. But kids have better access to more lists, as you point out. Can you post a link to the blog post re: the 1983 bee? I think that'd be great to see, and can't find it on their blog. Joel: Wow, the memories! I love your "tied for 18th in 1988." It sounds so much better to me than what I've said for so long...39th. Wonder how that worked out for all the sixth-rounders in 1987? "IKO IKO"! Man, I forgot about that song! Fun one. Ya know, going back to DC always sounds fun. Maybe 2011 will be the year! Maybe you could upload yours to Youtube! I wonder how far back the winners appeared on the Tonight Show? Was Jacques Bailly on there, or did it start in the late 80s? Was all of day 2 of the NSB broadcast live on CNN back in '86, '87, '88? Or just the last 2 spellers? I don't have a copy of my Tonight Show appearance, for better or for worse. I'm not sure when winners began appearing on the Tonight Show. In 1986, I just happened to see the bee on CNN, and they were down to the last 4 or 5 spellers, if I remember right. They definitely did not broadcast the entire 2nd day, and I'm not sure if they ever have.